When it comes to horror stories, renting in New York City seemingly tops the list for many people who’ve experienced living in the Big Apple. There’s no question that the rental industry has a definitive sketch factor to it in NYC. With small apartments, huge broker fees, misleading ads and sketchy real estate agents, it’s not hard to see why people dread searching for an apartment in New York City. Searching for a rental in NYC doesn’t have to be a nightmare. 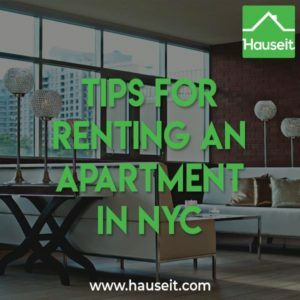 By following the tips and principals below, you can maximize your chances of having a positive and successful apartment search in New York City. Everything happens quickly in NYC, and this is especially so in the case of the real estate market. Given the limited inventory of apartments in NYC, most apartments are rented relatively quickly. Having your rental paperwork ready in advance of your search will maximize your chances of outmaneuvering the competition and renting your dream home. If you’re searching for an ‘affordable’ entry-level apartment, chance are that there will be a line of other candidates who are interested in renting the unit. Most apartments are first-come first-serve, meaning that the first person who submits a completed application is the one who will be able to rent the apartment. If you’re renting a co-op apartment, the application will likely be much more extensive. A typical co-op rental application will ask for all of the documents above in addition to a financial statement, reference letters and the possibility of higher than usual application fees, move-in fees and a move-in deposit. When it comes to rental broker fees in NYC, it’s important to crunch the numbers before simply assuming that ‘fee’ rentals are more expensive than ‘no fee’ rentals in NYC. 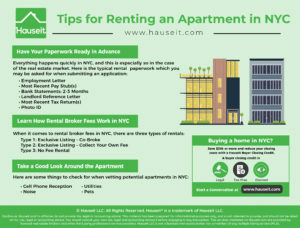 The truth is that not all rental apartments in NYC have broker fees, but it’s not always the case that ‘no fee’ rentals are the least expensive options. In many cases, landlords list units as ‘no fee’ in order to get away with charging a premium on the monthly rental rate itself. These landlords are banking on the fact that renters will not question the asking rent, as they will automatically assume that ‘no fee’ means that the apartment is a good deal. When a rental is an exclusive listing, it means that the landlord has authorized one broker to advertise the property and procure a tenant. The listing broker has pre-negotiated a specific rental commission with the landlord which he or she will charge the tenant. In most cases, the rental broker fee is 15% of the annual rent or one month worth of rent. If you submit an application directly to the listing broker, you’d pay the entire broker fee to that agent. If you have your own tenant’s broker, you’d still pay the same total broker fee but it would be split equally between your agent (tenant’s agent) and the landlord’s agent. 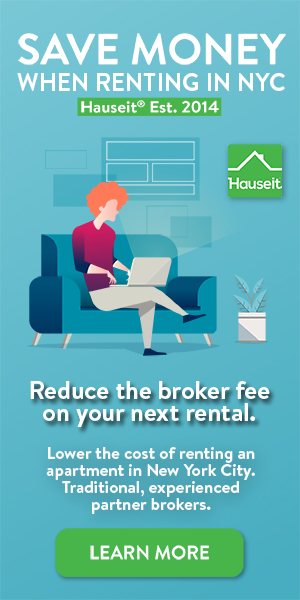 You can reduce your broker fee on an exclusive co-broke rental listing by requesting a Hauseit® Rental Broker Fee Credit. For a CYOF exclusive listing, the listing broker will be paid a broker fee directly by the landlord. If you bring your own tenant’s agent, your agent would charge you a broker fee which would be pocketed entirely by him or her as your representative. If you work directly with the listing broker, you would not pay a broker fee since the landlord has agreed to pay it. If a unit is no-fee, it either means that the landlord is covering all broker fees or you are renting directly from a leasing office and no broker fee applies. Most NYC apartment rentals have rigid annual income requirements which are usually around 40x the monthly rent. If you do not meet this requirement, you would need to have a guarantor, pay a large portion of the annual rent upfront, or demonstrate that you have large financial assets. A co-op apartment is a unique form of apartment ownership whereby unit owners own shares in a corporation that owns the apartment building. Individual unit owners also have a proprietary lease which gives them the right to occupy a specific apartment in the co-op. Co-ops are usually less expensive than condos in NYC, but the tradeoff is that most co-ops have subletting restrictions. These subletting rules restrict the length for which an owner can sublet his or her unit, and they also require prospective tenants to submit a large application and undergo co-op board approval. Co-op apartments almost always have extensive applications which both prospective buyers and renters are required to complete. Almost all co-ops will also require a board interview for prospective occupants. The risk of renting a co-op apartment in NYC is that you may spend an extraordinary amount of time completing an application, only to be rejected by the co-op board without any recourse or back-up plan. With that said, not all co-ops are difficult to deal with. 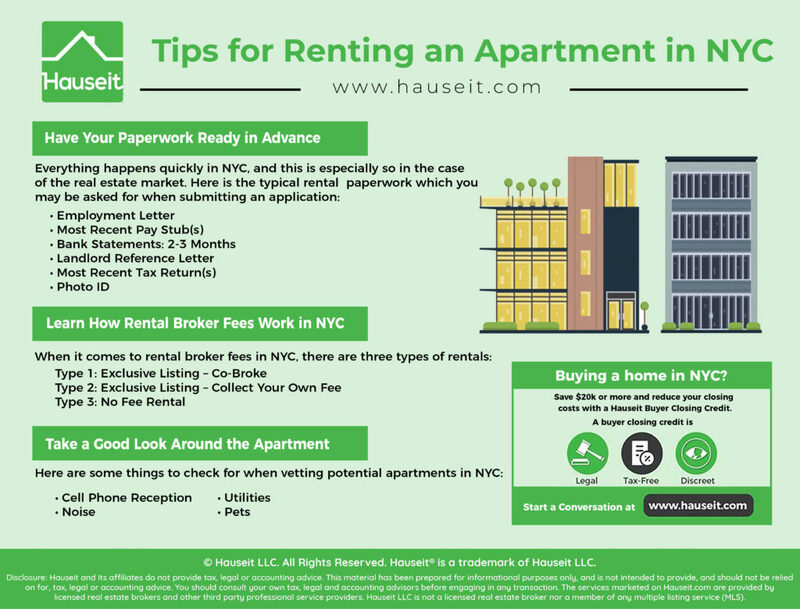 There are many co-op buildings in NYC which have a relatively straightforward rental application process. Furthermore, there are some benefits to renting a co-op vs. living in a rental building. Since co-ops are infrequently rented, it means that the unit may be in better condition compared to a rental unit. Furthermore, co-op buildings typically have stronger communities since there is less turnover among residents. It’s a good idea to prepare your own checklist for what to inspect each time you view a potential apartment. In most cases, you’ll have very little time or opportunity to take another look at an apartment before deciding to move forward. Cell Phone Reception – is there adequate cell tower service in the apartment? Keep in mind that WiFi calling won’t be helpful to infrequent guests or acquaintances who do not have your password. Noise – how insulated is the apartment? Keep in mind that street noise is higher during business hours, so if you viewed a unit on Saturday or Sunday it will likely be much louder come Monday. Utilities – what utilities are included in the rent? This is a great question to ask the listing agent, ideally in writing so you have a record of it. Pets – are pets permitted in the building? Once again, it’s a good idea to get this information in writing from the listing broker.